For easy access to the rear seat, use the seatback lock release lever or seatback angle adjustment lever. When the seatback lock release lever or seatback angle adjustment lever is used, the seat’s original slide position is memorized, so the seat may be returned to that original position. The seatback will be returned to the fully upright position. Lift the seatback lock release lever or seatback angle adjustment lever. The seatback will fold forward, and the seat’s slide lock will be released. Move the seat all the way forward. Slide the seat backward and then lift the seatback. The seat will be set and locked to its previous slide position automatically, and the seatback will be returned to the fully upright position. In the following situations, the seat slide position memory will not be saved or will be overwritten. ●The seatback is lifted upright at a slide position farther forward than the memorized position. 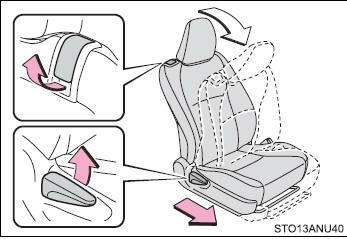 ●The seat slide position is memorized when the seat is slid all the way or nearly all the way forward. ●The seat is slid farther back than the memorized position by using the seat position adjustment lever. Lift the seatback lock release lever or seatback angle adjustment lever after removing the luggage, or after having the passenger get out or sit properly so that the seat can be slid back to the previous position. 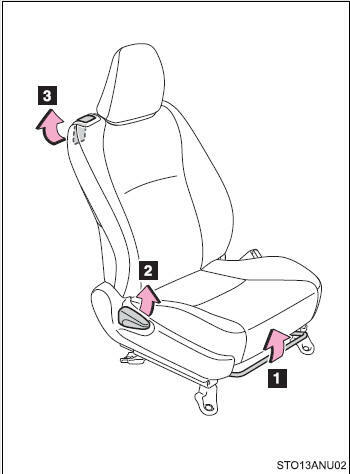 ●To reduce the risk of sliding under the lap belt during a collision, do not recline the seat more than necessary. ●Never allow anyone to touch seatback lock release levers while the vehicle is moving. ●If anyone is in the vicinity, make sure they are clear of the seat back path and let them know that the seat is about to move. Make sure the seatback is securely locked by pushing it forward and rearward. Failure to do so may result in death or serious injury. Do not use the seatback angle adjustment lever and seatback lock release lever at the same time. If they are used together, the seat lock mechanism may be damaged.